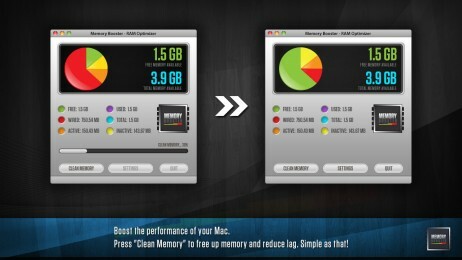 Quickly free up memory and boost performance on your Mac's applications! Free inactive memory, and optimize your precious RAM to allow the cleanest performance for a wide variety of applications! Whether its Office, Photoshop, or video games, memory booster can greatly enhance your usage! Memory information and statistics are presented in a clear, easy-to-understand graphical interface, and the optimizations are available to see immediately! I have a decent amount of RAM. I have 4gb installed on my MacBook Pro (Early 2011 version). I use Adobe Photoshop and Adobe Lightroom heavily. I usually like having multiple windows open and i rarely reboot. I just like leaving my computer on and putting it to sleep. I hate waiting for it to reboot to get a fresh start. This gets my computer running sluggishly somtimes. Now I can easily just run this app and clear up some space. It’s got a pretty unique feature that also monitors the memory and automatically cleans it if it reaches a certain threshold. Great app and definitely worth the initial promo price. I’m a frequent gamer, and this app helps make things run better. I have a pretty beefy macbook pro, and I tend to run memory intensive games like MMO’s. A small but noticable difference in performance. I’d say getting 45-50 fps before, and over 50 after. Works especially well if you’ve been running through several different applications for a while.